In my previous post I showed how US inflation can be decomposed between demand inflation and supply inflation by using what I term an Quasi-Real Price Index (QRPI). In the coming posts I will have a look at use US monetary history through the lens of QRPI. We start with the 1960s. In monetary terms the 1960s in some sense was a relatively “boring” decade in the sense that inflation remained low and relatively stable and growth – real and nominal – was high and relatively stable. However, the monetary policies in the US during this period laid the “foundation” for the high inflation of the 1970s. In the first half of the 1960s inflation remained quite subdued at not much more than 1%, however, towards the end of the decade inflation started to take off. What is remarkable about the 1960s is the quite strong growth in productivity that kept inflation in check. The high growth in productivity “allowed” for easier monetary policy than would otherwise have been the case an demand inflation accelerated all through the 1960s and towards the end of the decade demand inflation was running at 5-6% and as productivity growth eased off in 1966-67 headline inflation started to inch up. In fact demand inflation was nearly as high in the later part of the 1960s in the US as was the case in the otherwise inflationary 1970s. In that sense it can said that the “Great Inflation” really started in 1960 rather than in the 1970s. My favourite source on US monetary history after the second War World is Allan Meltzer’s excellent book(s) “A History of the Federal Reserve”. However, Robert Hetzel’s – somewhat shorter – book “The Monetary Policy of the Federal Reserve: A History” also is very good. Both Meltzer and Hetzel note a number of key elements that were decisive for the conduct of monetary policy in the US in the 1960s. A striking feature during the 1960s was to what extent the Federal Reserve was very direct political pressure by especially the Kennedy and Johnson administrations on the Fed to ease monetary policy. Another feature was the most Federal Reserve officials did not share Milton Friedman’s dictum that inflation is a monetary phenomenon rather the Fed thinking was strongly Keynesian and so was the thinking of the President’s Council of Economic Advisors. 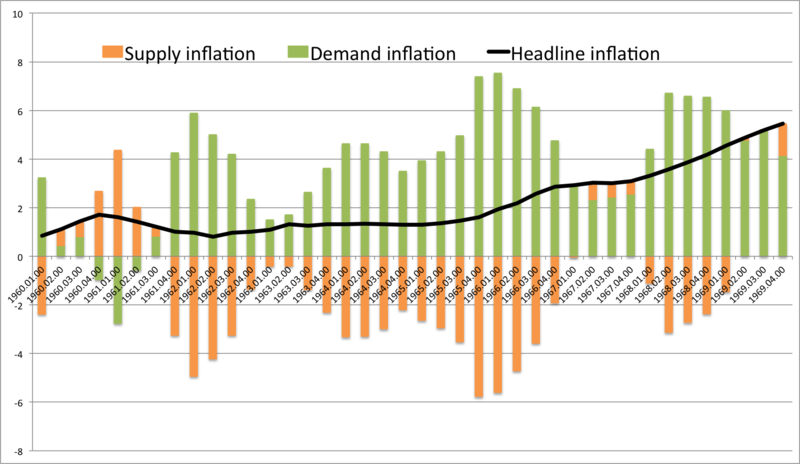 As a consequence the Federal Reserve seemed to have ignored the rising inflationary pressures due to demand inflation and as such is fully to blame for the high headline inflation in the 1970. I will address that in my next post on US monetary history from an QRPI perspective.